While Call of Duty: Infinite Warfare takes place in the future, its initial Zombies experience is firmly rooted in the past. In Zombies in Spaceland, four aspiring actors are transported to a zombie-infested space theme park by Paul “Pee-wee Herman” Reubens. Reubens plays a once-popular horror actor who lures the player characters to an abandoned movie theater, where they’re transported to the park as four ‘80s stereotypes—The Jock (Ike Barinholtz), The Dork (Seth Green), The Rapper (Jay Pharoh) and The Valley Girl (Sasheer Zamata). There they must survive using only their wits and the aid of a mysterious DJ portrayed by David Hasselhoff. 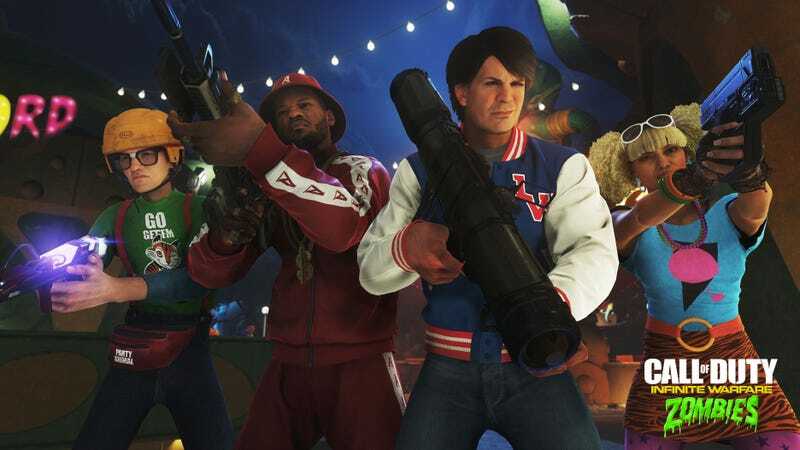 Activision is hosting a Zombies in Spaceland stream tomorrow, giving fans more information on the outlandish game mode, which will be playable next month at the Call of Duty XP convention early next month.